Peter Waller has brought our attention to a detailed paper from the Crown (Marine) Estate describing the rather complex details of the offshore banks and the current state of knowledge on their formation and movement. The paper contains plethora of historical data and information relating to the tide and sand movement. Readers will find it to be rich in charts and diagrams, but rather thin on actual empirical evidence. However, it explains the otherwise apparent anomalies of the currents and tides around the Norfolk offshore sandbanks through history, and may be seen in full by clicking the image on the right. The Great Yarmouth Banks lie sub-parallel to the modern Norfolk coast. The most nearshore of these banks appear to be attached to the shoreface at the location of small headlands, known locally as nesses. Thus, Caister ShoalA sandbank or sandbar that makes the water shallow extends northwards from Caister Ness, and Holm Sand is attached to Lowestoft Ness. The nearshore banks are smaller, much more closely spaced and are generally set much higher in the tidal frame (and are in places inter-tidal) than the more offshore banks. 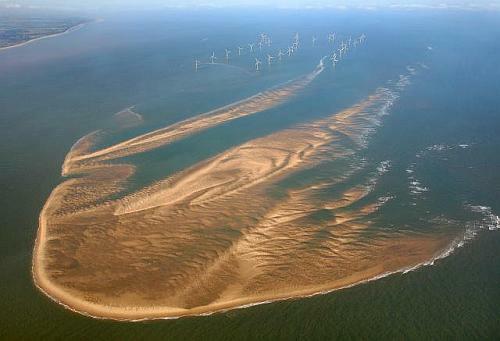 Banks are between 4 and 15km long, 1.5 to 3km wide and are mostly between 10 and 20m high above the surrounding sea floor. Sandbanks such as Holm Sand and Scroby Sands may have much shallower depths on their landward margins than on their seaward sides which are prone to breaking waves. The nearshore banks such as Scroby Sands are within 2 to 3.5km of the modern coastline. The next question; is there evidence of a dynamic link between the inner sand banks and the outer sand banks i.e. a transfer of material? Another notable feature of the Great Yarmouth Banks is that they are interlaced with flood and ebb channels, as identified by Robinson (1966). Two features are particularly notable. First, the main flow direction is west north west to west south east along the North Norfolk coast to the north of the Great Yarmouth Banks and north north east to south south west along the Suffolk coast to the south. Consequently, the location of the Great Yarmouth Banks is a turning point for the tidal flow. Secondly, the ebb and flood channels cut through the banks at relatively regular intervals, forming what appears to be a series of meandering channels that cross each other at each end of the bank. From the above quoted section, it can be deduced that the answer to this question is decidedly ‘ yes!’. Stephen and I therefore feel there is substantial evidence here in this report to present to the MMO, which suggests that coastal erosion is linked to aggregate dredging. Firstly, increased wave height due to reduced sand banks (greater depth of water allowing larger waves to form) is working in conjunction with excavation offshore (dredged sites) which are being in-filled by sand from adjacent sandbanks which, in turn are linked to each other in a chain which ultimately leads back to the coast. Thus sand eroded from the coast is ending up in dredged sites, aided and abetted by a process that requires sand in order to replace the sand that has been excavated.